Piracy on the infinite sea of stars. Now that she is back on land, Marika intends to take it easy. She’ll get in some pirating when her school schedule allows it. And taking it easy is best done on the beach, so episode 6 of Bodacious Space Pirates (Mouretsu Pirates) is going to be the typical beach episode, right? Unfortunately for Marika and her pal, Mami, there’s a little paperwork to be filled out first. 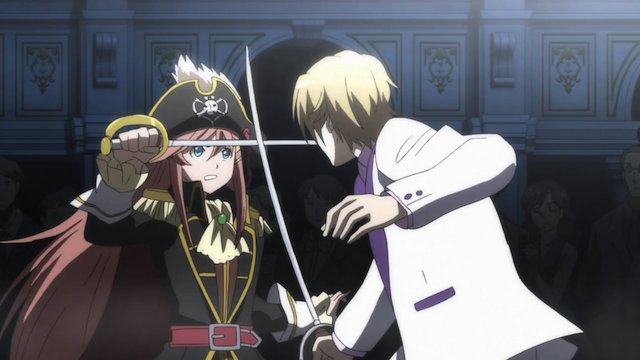 This episode had the feel of opening up a brand new volume in the B-Space Pirates saga, and much like the first arc (episodes 1-5), this one takes us in unexpected directions. 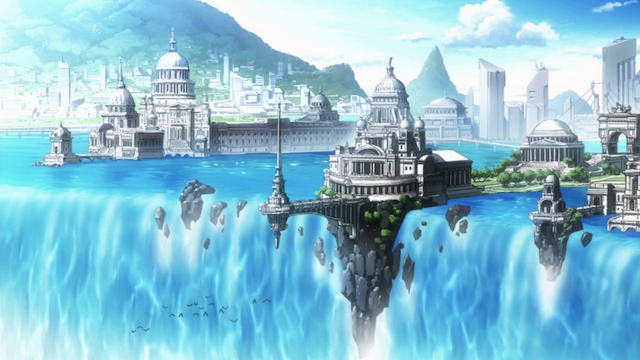 Government buildings on the planet, Sea of Morningstar. 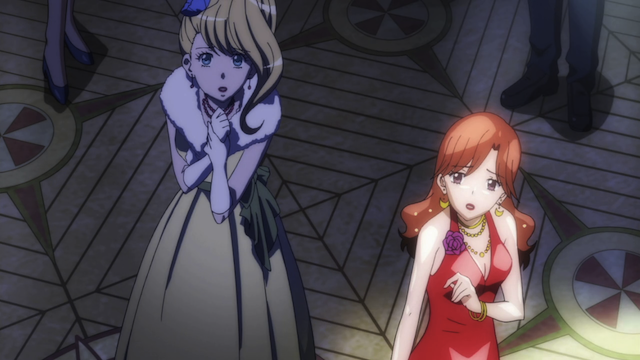 Marika and Mami are disappointed to find their day of fun in the sun hijacked by the need to accommodate the bureaucracy. 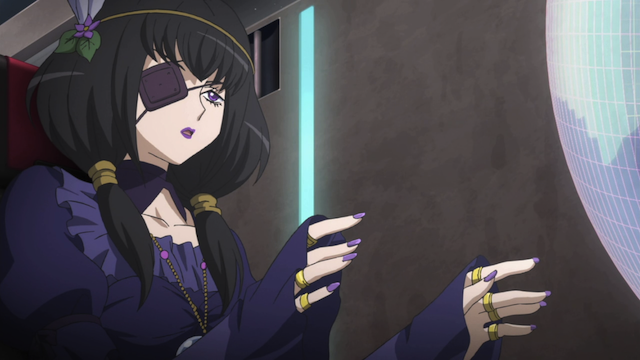 Marika is led by Misa Grandwood to over 20 offices to sign, stamp, and do as necessary to have the Bentenmaru’s Letter of Remarque re-instated. Only when the long day of official business is finally over, does Marika realize how badly she has been had. The Letter of Remarque that she spent all day attaining will expire if they don’t do some pirating within “forty-nine days, nine hours, and twenty-two minutes”. And thus Marika finds her idle days of Summer vacation will be spent toiling on the Bentenmaru in an accelerated ship’s captain training program. The life of a pirate captain isn't all rum and pet parrots. 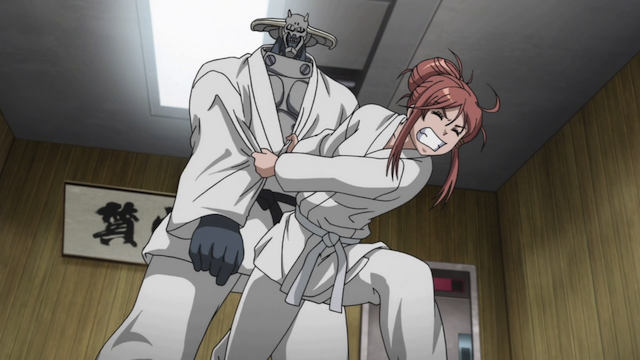 Marika's martial arts instructor is a very large, and surprisingly thoughtful robot named Schnitzer. Misa Grandwood. Every once in a while you are lucky enough to have a teacher who makes the material come to life. The training regimen is quite grueling, but makes a lot of sense. She runs through emergency situations in a simulation room, gets drilled on electronic warfare basics, engages in hand-to-hand combat practice, studies the ship’s structure, navigational charts, and gets a refresher on pirate history, and the politics that enable them to continue to exist to this day. Chiaki Kurihara, secretly glad to see her friend, but too ashamed to admit it. There is even a special surprise: Chiaki comes aboard to join in the training sessions for a few days, which, of course, is much more fun for Marika than studying alone. But after a bit of deck swabbing, 海賊の時間だ！Marika takes on her first official act of piracy, as the Bentenmaru attacks the luxury liner, Apricot Princess. And once again my expectations failed to prepare me for what we got. The actual electronic warfare battle that we are, at this point, quite well-prepared to follow, was completely elided, and instead we got a sense that wealthy space-goers (those that ride on luxury liners at any rate) actually enjoy being preyed upon by space pirates, since the danger is low (as long as they hand over their valuables). Even their loss of property is negligible, since the liner is insured, and guests will be reimbursed for their losses. In effect, the encounter is just another diversion for the wealthy passengers, who get to go home and tell everybody that they were attacked by pirates. The Princess Apricot ends faster than light travel in a very dangerous place. First-timers quiver in fear as the ferocious pirates announce they are boarding. A thrill runs through the crowd, as a single individual steps forward to challenge the pirate captain and demand safe passage for the Princess Apricot and the ladies that are aboard her. Once again deception is a key component to the strategy. In a staged battle, Kane, who previously joined the passengers of the Princess Apricot, “resists” the pirate attack, nearly winning a sword duel with the young pirate captain, only to be treacherously shot “to death”. With the resistance subdued, the rest of the passengers are quite willing to peacefully turn over their jewels and other on-hand valuables. The message? Don't try to be a hero. 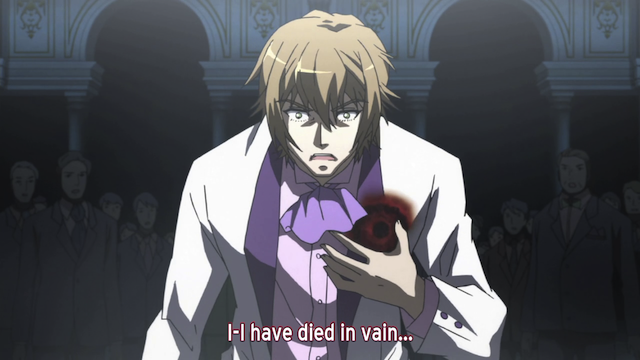 This show is quite remarkable for sending the story off in unexpected directions. This time we could have expected a proper introduction to the Bentenmaru and its crew, but instead we are forced to guess about most of the new characters by seeing them only in montages, or making comments from the side. We have Marika’s first official piracy, and it is 95% head fake. This isn’t to say it made no sense. 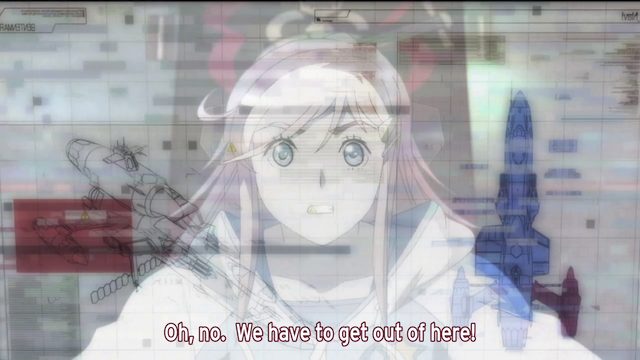 Marika needed to lead an attack within the bureaucratically prescribed time frame. A soft target like the Princess Apricot was perfect, and Kane’s staged resistance was a great way to convince anyone wondering if they really needed to part with their fancy watches and what-not. Bridge of the Bentenmaru (view from the front). Schematic: Bridge of the Bentenmaru (from above) showing seating assignments. This was our first chance to see the bridge layout of the Bentenmaru, so I was curious to see what it would be like. By examining various shots, I created the above schematic view. The ?? on the top-left might not even be a station, it could be a weapons locker for all I know. 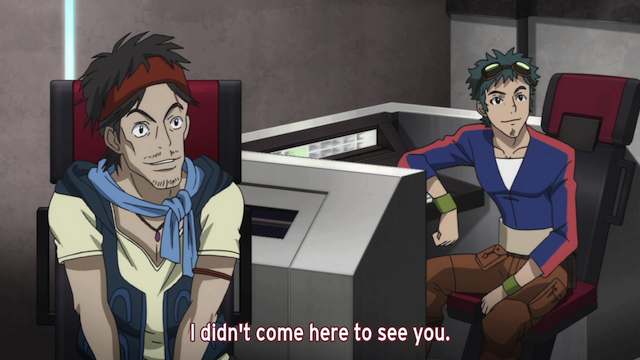 Marika and Kane are the only members of the bridge crew whose functions have been made clear. (I assume, BTW, that Misa’s primary station is not on the bridge as the ship’s doctor probably needs a space equipped for medical analysis and treatment). 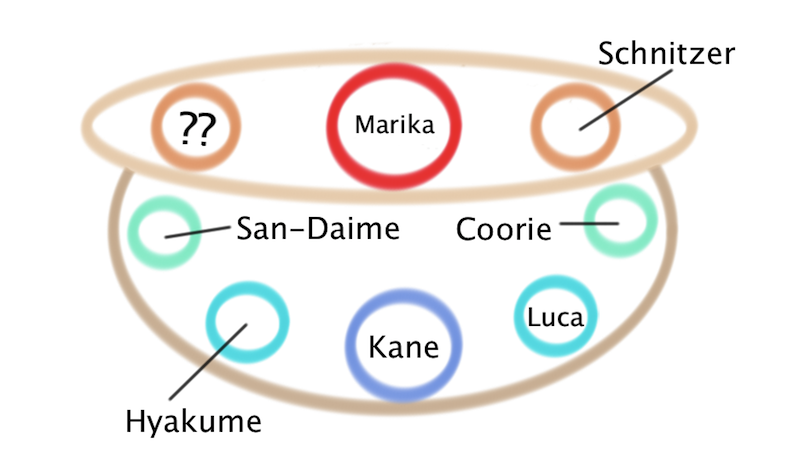 Marika is the captain, of course, and Kane is the navigator. The rest we might guess from what we saw in this episode. Of those Schnitzer, the robot, seems a likely candidate for security officer, or some such, given his role in training Marika in weapons and hand-to-hand combat. 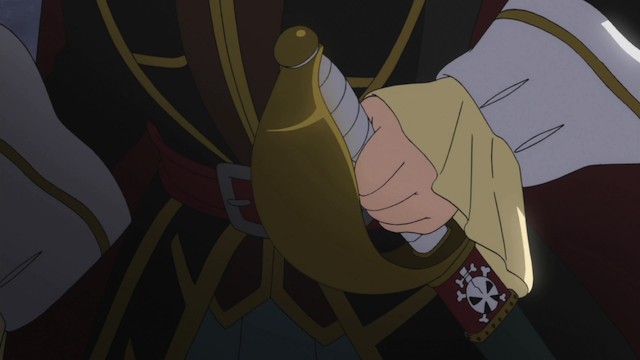 My guess is that both Hyakume and San-Daime are involved with “engineering”, although it is also quite likely that one of them is responsible for the ship’s weapons systems. San-Daime was shown guiding Marika in the construction of a replica of the Bentenmaru. That would be a pretty good way to learn the structure of the ship. 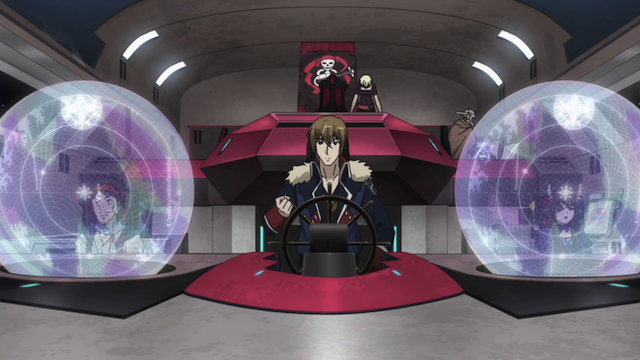 Hyakume was previously shown to have checked out the Odette II for Kane. 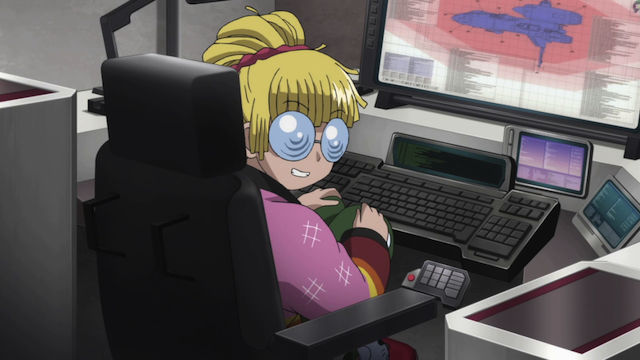 Coorie seemed to be taking the lead in teaching Marika electronic warfare. 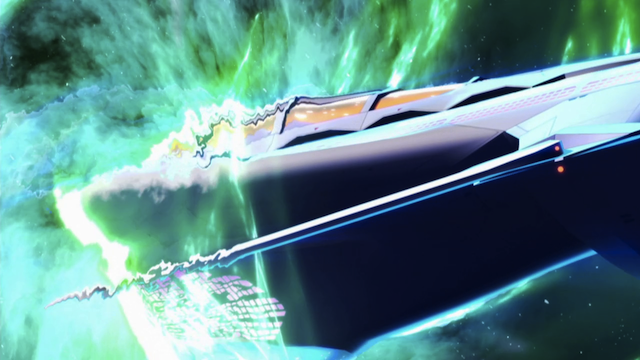 A space pirate ship could probably benefit from having a dedicated bridge officer for electronic warfare, so I’m going to guess that is her role, although her duties might also include other offensive and or defensive systems. Luca. Very mysterious. She seems to have fewer emotions than Schnitzer, and stays in this position with hands raised. Perhaps it is her outfit, perhaps it is her trance-like expression, or perhaps because it looks like she is staring into a giant crystal ball, but Luca reminds me of some sort of gypsy seer. That impression may have shaped my thinking here, but I am guessing that she is in charge of remote sensing. 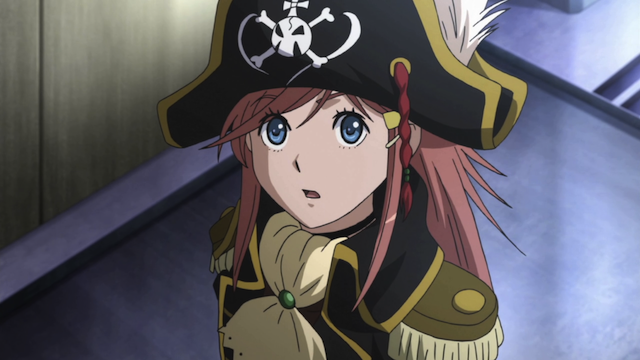 Marika, the captain of the space pirate ship, Bentenmaru. Where we go from here is anybody’s guess. If this arc is structured similarly to the last, next episode will still be rising action. On the other hand, this series has shown a capability to overturn my expectations with ease. i guess there is nothing to do, but wait for next week. Yeah, there are some oddities here for sure. I noticed the employees on the Princess Apricot put away champagne glasses and musical instruments just before the attack. I wouldn’t be surprised if most passengers knew there was a reasonable chance of getting attacked by pirates before booking the cruise. They came out of FTL travel in a place known for pirate attacks, so this must have been a recognized risk at the very least. The passengers seemed to view the attack like a close encounter with a wild animal while they were on safari. As long as they followed the safety guidelines, they would go home with something to brag about. Now how all of this fits in to the larger political order is beyond me. What I enjoyed about this episode was how the anime continued to keep its high level of detail but completely shift the focus from hard sci-fi material to the fun world of piracy. Thought the details do feel different than learning about electronic warfare and charting a course through the stars, there was plenty of detail on Marika’s licensure, training, and even her first act of piracy. And without a doubt, this episode was the most fun in the series. Hopefully it won’t hold that distinction for long since I want more episodes like this but I expect the next episode to have a hint of more seriousness judging from the previews. Glad to see you enjoyed this episode about as much as I did. There was a lot of detail, wasn’t there? I was amused by that weird shot of Marika and Misa crawling through an alley (crawling isn’t quite the right phrase — ? back-walking ?) in between something that looked like Hong Kong (some very dense urban area) and the place she buys the white outfit. It really made you wonder what all they were going through to get this paperwork filed. The were a few bits of hard scifi, and still fairly accurate. The main one I saw was the use of hardsuits for EVA away from the ship while in a debris field; asteroids in this case. You wouldn’t want to be wandering around in that in a soft/firmsuit, it’d be perforated fairly quickly. Looks like the suits had extra propellant tanks too, if those shafts on the back are what I think they are. I’m just continuing to enjoy the unexpected things this series continues to throw at me. It’s so refreshing to be surprised like this. That’s a funny thought, that Misa was pranking Marika by doing the wall-crawl. 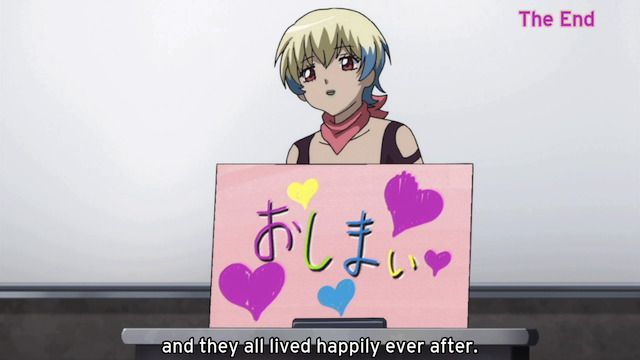 It certainly continues to confound me, and that makes it so much fun to watch each week. Wow, I just got a brainwave. Just like how cowboys are part of America’s culture, perhaps pirates are just part of the Sea of the Morningstar’s culture? Just like how Japanese people have ninja plays (actually, to my knowledge, they don’t have ninja plays), maybe the Sea of the Morningstar frequently has mock pirate sieges to commemorate its rich pirate history? After all, pirates were the ones who stopped… uh… nothing at all. Whoops. It isn’t clear to me that the people on the Princess Apricot were from Sea of Morningstar, so we would need to know something about the culture and history of the galactic empire as a whole. Which might be where this is heading. It is a bit too early to tell. Then again, don’t visitors to America also want to experience wild west culture, and visitors to Japan also want to experience traditional Japanese plays? While I was in California I went to Jamestown, an old Gold Rush town. It was pretty fun. Not as much fun as driving through a Redwood, though.